Feeling patriotic? 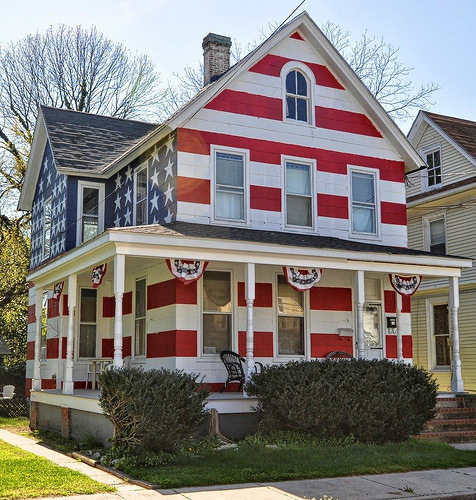 People certainly enjoy seeing the U.S. flag waving proudly from a home, but some have taken the red, white and blue theme to extremes. The above home is located in historic Cambridge, Maryland. It was painted red, white and blue to make a statement to the local historic preservation organization. The owner wanted to replace windows, but was forced to follow the historical code which made it very costly. After reading the by laws, he realized that paint colors were not regulated and thus (as a protest) painted his home red, white and blue. This home is now a bit of a tourist attraction. Read more about this home here and here. See more red, white and blue homes here. We suggest you decorate your home with banners, flags, pillows, flowers and wreaths that are red, white and blue. See some ideas from Sibcy Cline’s 4th of July Pinterest board here. This entry was posted in Have Fun!, Holidays and tagged cambridge, maryland, patriotic houses, red, white and blue house by susanaknabe. Bookmark the permalink.